Bouncer's Dusky 33 is always taking conservation minded fishing to the max! 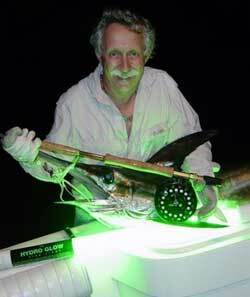 Finalist for "Guide of the year"
to produce a swordfish on fly. Marty Arostegui with a 46 inch swordfish caught off Miami, Florida. Henry H. Hyman award for commendable public service in recognizing, preserving and developing the economic importance of sportfishing opportunities in South Florida. A deserving Captain Bouncer Smith receives congrats from previous winner Bob Harden. Capt. Bouncer Smith receives congrats from previous winner Bob Harden. and shown them what they can accomplish, and enjoyed their smiles. He works on tournament committees and uses these opportunities to encourage conservation. He shares his knowledge freely with those new and uneducated who are the fishermen of tomorrow. He is never too tired, or too busy, and he often forsakes his own income to do for some charity or be there for someone in need. It's not an easy task to consider all the amazing contributions and accomplishments of nominations for the MET's prestigious Hyman Award. Capt. Bouncer Smith's name was submitted by his sister Susan Singer. Even without her fine letter extolling his virtues there would have been, no contest. Everyone on the Judges Committee made an instant 'yes' vote, but we want to share excerpts from her letter: "Bouncer has spoken before audiences across the country, from cold Chicago evenings to warm Ft. Lauderdale ones, to fishermen who only dream of fishing in South Florida to fishermen who enjoy our waters regularly. His articles for magazines, his work with radio and television, as well as seminars and guest appearances are filled with stories of fishing in south Florida". But more than a spokesman for South Florida, and more than a soldier in the fight for conservation measures in South Florida, this is a man who never says no to those who need him. He is there for the Make a Wish Foundation, Easter Seals, Diabetes, Big Brothers, etc. He has for years taken physically handicapped children and adults fishing. 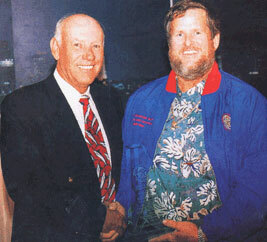 He joins the ranks of the Who's Who in sportfishing leadership.